Oh Yeah! I could not stand it any longer. I just had to give my girl a Makeover! She was looking too homely for me. 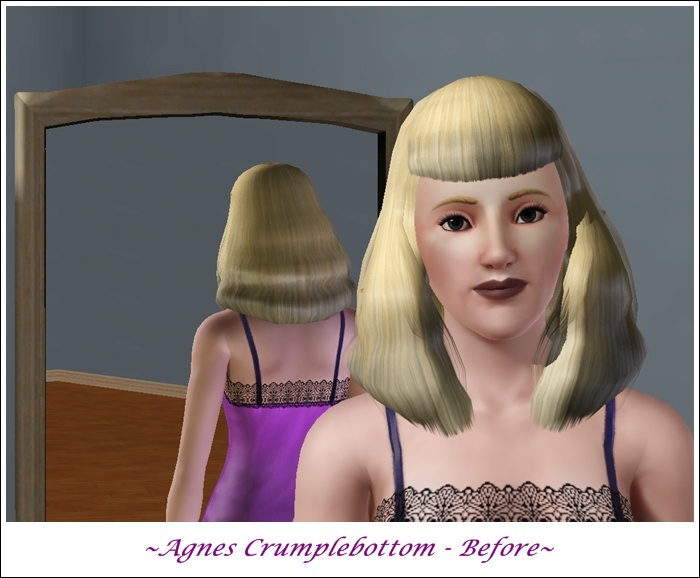 Re: Agnes Crumplebottom - Makeover! Great job! I couldn't stand her homeliness, either. I will have to post pics of my makeovers when I can! HeHe! That's funny... I don't know why they make them look so homely, I guess so we can make them look better. And yes, please share your remakes. I enjoy seeing what others have done. That's a big improvement. I have Sims3, but haven't played very much. I just can't get use to the way the Sims look. Romance Sims . . . Gotta love 'em! I know what you mean. I am not a great fan myself. I may be changing all of them I play. I know I've changed all of the ones I have so far. They look,, Strange huh? They do, even after they made some improvements (which you never see the original sim appearance because of Origin's mandatory update. They looked like stoned dough-people - not kidding) they still are very blah, so that's where CC skintones and eyes come in. They have some nice ones on MTS they will improve their looks drastically. I'll go check them out. Any ones that you prefer more, Cinda? It's been so long since I had played TS3 before that I can't remember which skins I liked best, and all of my Sims 2 and Sims 3 CC is backed up on disk. Unfortunately, my disk drive went out a while back and I can't retrieve it until I get new PC. I will take a peek over there and see if I can find them. I've always been partial to Ephemera's (Teru K) skins since TS2, so I'm pretty sure the ones I had are his. I believe the ones I always used are these. There are many more skins you can play with to see which you like best. Okay, Thanks! Now one other question. When I download stuff for Sims3, do I put them in my Download folder in Electronic Arts? Yes, put them there; if they are Sims 3 installer files also open up TS3 Launcher click downloads, select all then you can install them all at once. This is the fastest and easiest way. This method only works if they are not in folders; if they are you will have to either take them out of their individual folders or go in and install the one at a time. Thanks Cinda! I'll try this tomorrow. 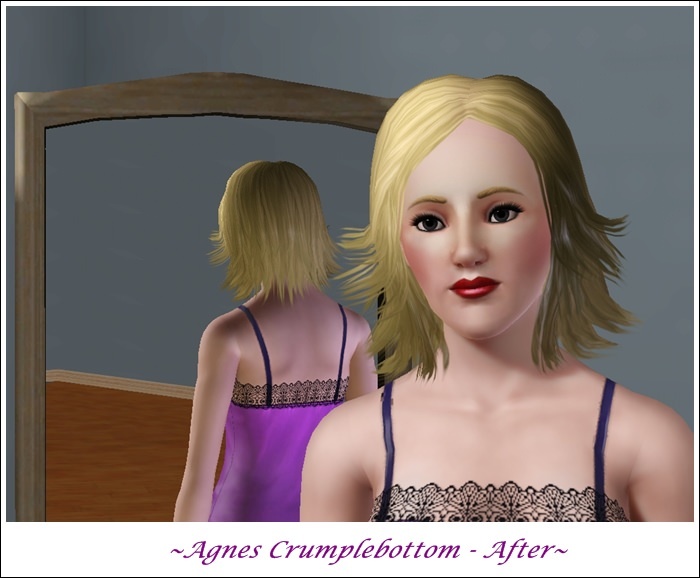 I was able to find my Agnes Crumplebottom Sim Remake!